The idea of ‘quiet’ has very different associations for people – some of us crave it, while others seek to avoid it at all costs. To a large extent, this is determined by how introverted or extroverted we are, but I believe it is a mistake to assume that the need for quiet is exclusive to introverts. 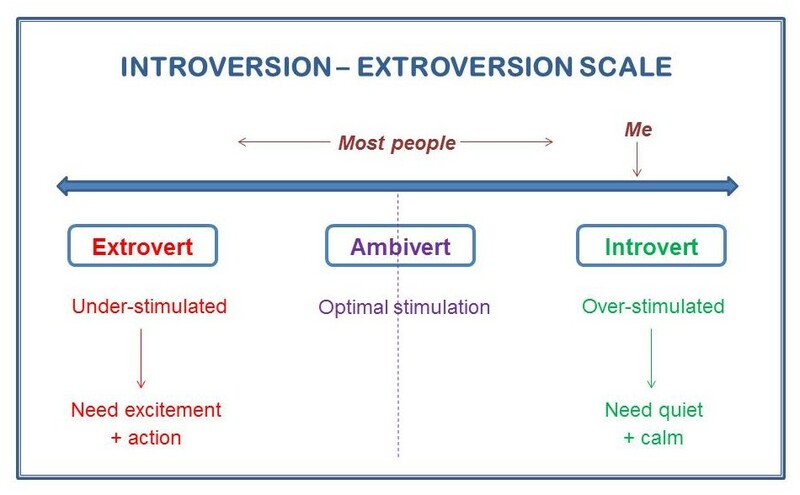 Introverts and extroverts have different needs when it comes to quiet because our brains work differently, depending on where we are on the introversion-extroversion scale (see diagram below**). In order to work properly, our brains need to get just the right amount of stimulation, i.e. not too much and not too little – an optimal level (represented by the dotted line in the diagram**). ** This is loosely based on a diagram created by Prof Brian Little. However, it is my own interpretation of how it works, so I cannot claim it is scientifically accurate! Introverts’ brains are already more stimulated than they need to be. So introverts need quiet and calm to help bring their brains down to the optimal level. On the other hand, extroverts’ brains are less stimulated than they need to be. So extroverts need excitement and action to help bring their brains up to the optimal level. Ambiverts are people whose brains are more or less at the optimal level already. However, nobody is just introvert or just extrovert. It’s a bit like being right or left-handed. For example, I am quite strongly right-handed, but I’m still capable of doing things with my left hand, it’s just more difficult and feels very uncomfortable. But actually it’s quite useful to learn to use our less dominant side sometimes because it helps make us more balanced and gives us flexibility. So essentially we all need a balance of quiet and excitement. It’s simply a question of getting the right proportions for us, depending on where we are on the scale. In reality of course it is a bit more complicated than that, because modern society is far from balanced. Increasingly we live in a 24/7 culture, bombarded with information, noise and activity. Modern technologies encourage us to be permanently switched on. Our cities are constantly awake, and our workplaces are fast-paced and pressured. These days, life is highly stimulating most of the time, whether we like it or not. For introverts, this means that we often struggle to get enough of the quiet and calm that we desperately need for our brains to work effectively. We are easily drained of energy and often feel overwhelmed by the world around us, particularly as our need for quiet is frequently misunderstood. Many fail to achieve their full potential. But extroverts can suffer too. In our ‘always on’ culture, extroverts can get too much of the excitement and action that they need. Perhaps you know someone who is always on the go and never seems to stop – like the Duracell bunny in the advertisement. But if extroverts never learn to switch off, they can risk burning out – after all, not even the Duracell bunny can keep going for ever. Increasingly, stimulation overload and stress are taking a huge toll on our mental and physical health. But there are also other casualties of a world without quiet. Regardless of whether we are introverts or extroverts, many of our most creative ideas and deepest insights come when we are alone with our thoughts. Without the space to think and reflect, our creativity and wisdom are stifled, to the detriment of all. I believe we all need more quiet in our lives, whether we know it or not. For introverts, quiet is our natural way of being, even though many of us have felt the need to adopt more extroverted behaviours in order to get by in the world. For us, quiet is an anchor which we need to return to – always. For extroverts, enjoying quiet is not always easy. But learning to adopt some more introverted behaviours can make extroverts more flexible and protect them from the pull towards ever faster, louder, more frenetic lives. Rather like the story of Icarus – for extroverts, the danger of flying too close to the sun is that the heat might melt their wings. Give it a go and see how it feels – I’m quite sure your brain will be better for it.